To ensure quick installation and commissioning of the softeners, we prefabricated the skid at our San Diego manufacturing plant, reducing onsite work from weeks to a few hours. Water Works engineered and built the system to allow for future expansion (see left side of the pipes) that will increase its capacity from 600 gallons/min to 900 gal/min in the future. The cloud-based PLC controls and monitors system via Ethernet, dynamically adjusting softener consumption and reducing operating costs. 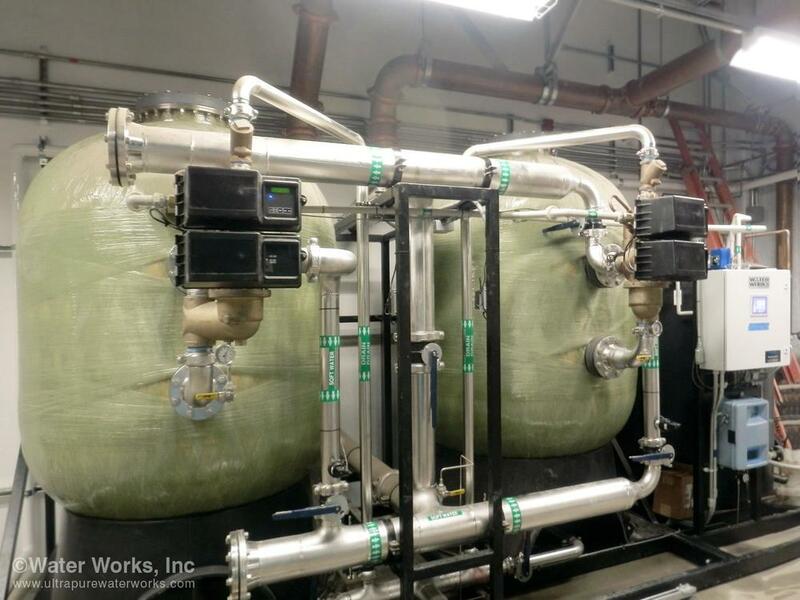 Water Works, Inc (San Diego, CA) announces the completed installation of an RO/DI ultrapure water system and an advanced water-softening system at the $859 million, 245-bed UC San Diego Health Jacobs Medical Center . The center is expected to open in 2016. The state-of-the-art water-softening system is installed at the two-story, 40,000-square-foot LEED Gold-Certified Central Utility Plant (CUP) that houses all utilities for the expanding hospital campus. The robust, dynamically-controlled softener system- engineered and installed by Water Works- will support all Jacobs Medical Center operations, and reduce operating costs and water consumption. UC San Diego Jacobs Medical Center is the largest hospital project in Southern California. The 10-story facility will house sections for cancer care, transplants, Woman and Infant care, plus two surgical floors. In addition, there will be two underground floors housing mechanical equipment, a blood bank, and a pharmaceutical operation. The RO/DI water system was designed and built in close collaboration with an A&E team who delivered specifications for water quality and quantity. To accommodate the large scale of the hospital operations, Water Works built an advanced 600 gpm water-softening system that included a 7,000 gallon underground brine-maker with duplex polypropylene transfer pumps. High system reliability is ensured by equipping the system with corrosion-resistant brass control valves, orbital welded stainless steel piping, and fiberglass (FRP) tanks. Looking ahead, the Water Works team designed and built the softener systems to be modular, using skid-mounts. This allows for seamless expansion in the future - including the upcoming, planned expansion of the system's nominal capacity from 600 to 900 gpm to accommodate campus build-out. The modular skid configurations allow for offsite assembly and testing, reducing installation time and cost, which (with the planned addition of a 3rd water softener) will have minimal impact on Central Utility Plant operations. One of the key elements of the installation was using a cloud-based programmable logic controller (PLC) with a Human Machine Interface (HMI) to control brine transfer, pump, and water level. The remote hardness analyzer measures softener capacity and dynamically initiates softener regeneration only when needed, reducing the cost of operating the softener and water consumption.